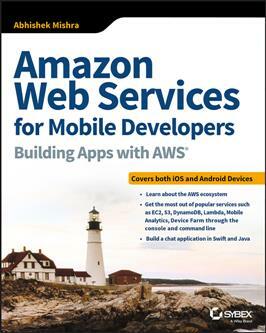 Amazon Web Services for Mobile Developers Building Apps with AWS | Free eBooks Download - EBOOKEE! Amazon Web Services for Mobile Developers: Building Apps with AWS presents a professional view of cloud computing and AWS for experienced iOS/Android developers and technical/solution architects. Cloud computing is a rapidly expanding ecosystem, and working professionals need a practical resource to bring them up-to-date on tools that are rapidly becoming indispensable; this book helps expand your skill set by introducing you to AWS offerings that can make your job easier, with a focus on real-world application. Author and mobile applications developer Abhishek Mishra shows you how to create IAM accounts and try out some of the most popular services, including EC2, Lambda, Mobile Analytics, Device Farm, and more. You'll build a chat application in both Swift (iOS) and Java (Andoid), running completely off AWS Infrastructure to explore SDK installation, Xcode, Cognito authentication, DynamoDB, Amazon SNA Notifications, and other useful tools. By actually using the tools as you learn about them, you develop a more intuitive understanding that feels less like a shift and more like a streamlined integration. If you have prior experience with Swift or Java and a solid knowledge of web services, this book can help you quickly take your skills to the next level with a practical approach to learning that translates easily into real-world use. Any job is easier with the right tools, and Amazon Web Services for Mobile Developers: Building Apps with AWS gets you acquainted with an ever-expanding toolkit for mobile app development. No comments for "Amazon Web Services for Mobile Developers Building Apps with AWS".